Day 2: The Bonus Bagging Trial Continues..
Day 2 of my Bonus Bagging trial begins with a look at my bet from yesterday. 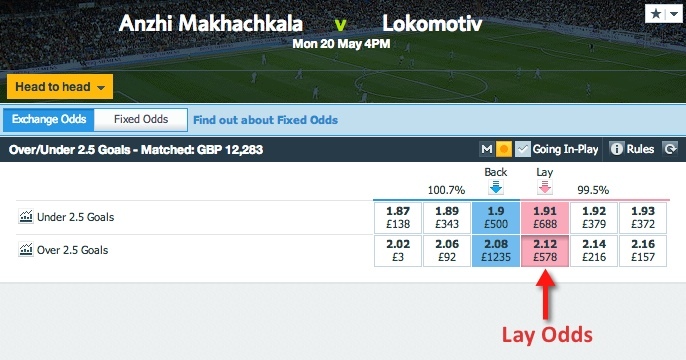 There were goals in the match between Anzhi Makhachkala and Lokomotiv. My PaddyPower bet therefore won and my Betfair lay lost. Carrying over from placing my £10 qualifying bet at PaddyPower, they have awarded me the £20 bonus. Time to turn it into profit! I log back into Bonus Bagging and hit ‘Claim Free Bet’. 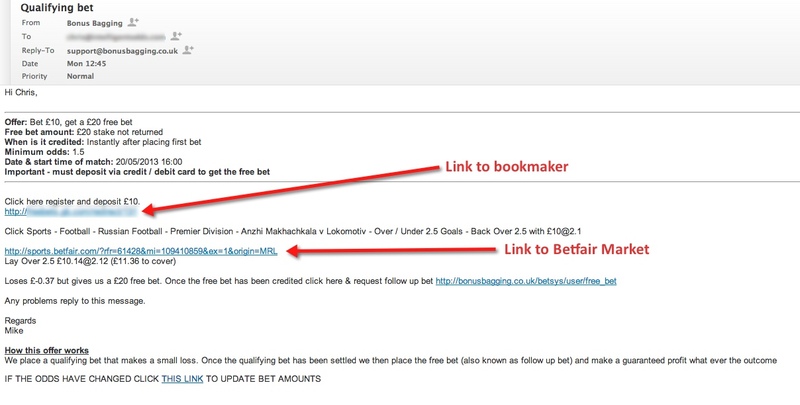 I’m then emailed instructions to place my free bet. Through the link provided, off I trot back to the PaddyPower web site to duly place my free bet. I select and stake my £20 free bet on the Draw at 3.60 as instructed. 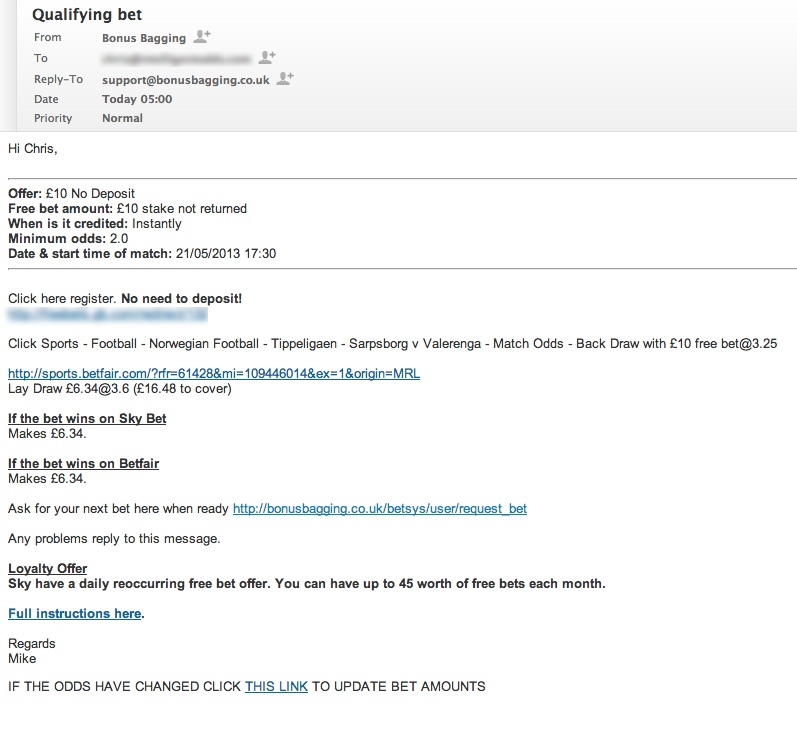 I lay £14.05 on the draw at 3.75 as per the email. Finished! 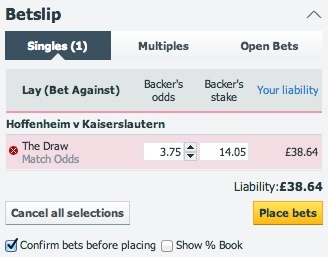 This bet will not settle until the match is played on Thursday, but in covering all outcomes I know that regardless of whether Hoffenheim and Kaiserslautern draw or not, I will have made £14.05. This one’s a beauty: a no deposit bonus! As per the email I lay £6.34 at odds of 3.6 on the draw. This creates a liability of £16.48. This match finishes tonight but the result doesn’t matter. I already know I have profited £6.34. Day 2 of my bonus bagging trial concludes and between the two days I’ve made £20 for about 20 minutes work total. That’s about £1/minute. Not bad! Ready to start bonus bagging yet? No? Check out day threes report of my matched betting experiment. Every day for the next week I’m going to demonstrate how matched betting works. To make things really simple I will not be researching the bets myself but instead using the Bonus Bagging service provided by Mike Cruickshank. In having completed the majority of signup offers myself already, for purpose of demonstration I will be paper betting. I will screen grab everything of significance as I go. I hope through this demonstration it will become obvious just how easy it is to profit from bookmaker signup offers! Assume that I am starting with the recommended Betfair balance of: £75. After logging in to the Bonus Bagging back end I hit “Request New Bet”. Easy as clicking a button..
Mike emails me with the recommended bet. 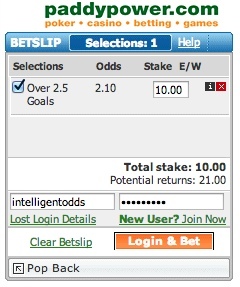 Clicking on Over 2.5 Goals adds it to the bet slip. Within the bet slip I check and place my bet. Once my bet is placed I head on back to the email and click the link that takes me straight to the correct Betfair market. I can then check and place the bet through the bet slip. That’s it! It’s taken me about 10 minutes total including time spent signing up to the bookmaker and my first bet has been placed. 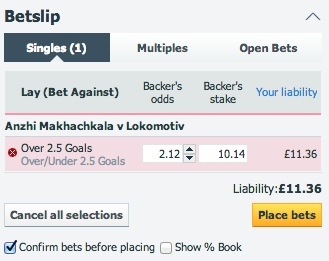 Regardless of what happens in this football match – whether there are over 2.5 goals or not – I have locked in a small loss of 37p. More importantly though, once the bet settles I will have qualified for PaddyPower’s £20 bonus. I’ll place that tomorrow. Read what happened on day two of the trial or trial Bonus Bagging with a 60-day money back guarantee.